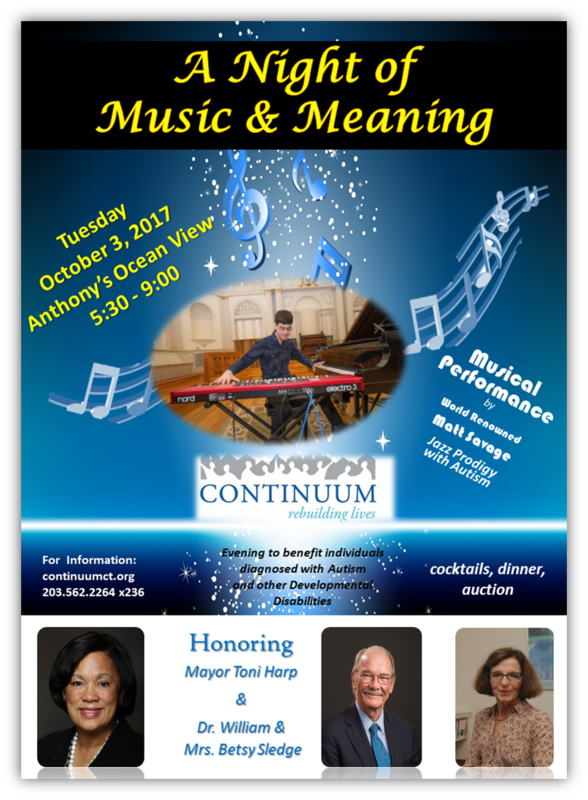 On Tuesday, October 3, 2017 Continuum of Care will host a charity event A Night of Music and Meaning at Anthony's Ocean View in New Haven, from 5:30 to 9:00 pm. The evening will be a celebration of three community leaders -- Mayor Toni Harp, and Dr. William and Mrs. Betsy Sledge -- and a special performance will be given by internationally acclaimed jazz musician Matt Savage, who was diagnosed with a form of autism at age 3. The evening will feature exquisite food, drinks, music, and a silent auction. Tickets are $125 per person, or a table of 10 is included with sponsorships. Contact Deborah Cox at dcox@continuumct.org or 203.562.2264 ext. 236 with any questions, or if you are interested in donating, sponsoring or helping with planning.